Years, Months, and Days, the new volume of poetry from Amanda Jernigan, has been described variously as prayers, meditations, translations, hymns, and fragments. All of these describe the book and yet none quite define them; the work is singular, not in terms of any groundbreaking innovation in style or format, but in conception and execution. The poems derive from lyrics, borrowed from the text of Die Gemeinschaftliche Liedersammlung, a collection of Protestant hymns originally in German, and later compiled for use by Ontario Mennonites in the Waterloo region. Rather than a offering a straight translation, Jernigan has restructured and re-framed these hymns, allowing for a more poetic and secular interpretation. As there is no side-by-side translation of the German originals (though such a translation, published in 2011, assisted Jernigan in the creation of these versions), it is difficult to know what exactly has been altered by Jernigan and what has been simply translated. In any case, what is written here is often stirring, as Jernigan uses these hymns to explore themes of aging, loss and mortality. Each piece in the book, some more hymn-like than poem-like, others very much fragmentary, is neatly placed just off-centre on each page, surrounded by space. This space invites pauses and contemplation. "I can see the place/near to me as you are,/clearly as your face,/but I cannot go there". This evocation of a face which is both "clearly" visible but unreachably absent is then visualised (or, more accurately, not-visualised) by the abundant space below the poem. The reader is invited here to conceive of the absent face themselves, the blank bottom of the page serving as an empty mirror for the reader's imagination to project onto. In a later piece, we find lines where the text has been reordered, so as to force the reader to process the words out of sequence: "carry my/come to me/cross with your/burdens". By putting the onus on the reader to navigate a dismantled series of lines, Jernigan seems to be making a statement about the nature of translation itself, about the necessary attention and analysis which go into a translator's work. Given her mission statement that the book is a "meditation on the possibility of translation," this short piece stands out as an exemplary success. Jernigan states that "the primary influence [for these poems] was musical", rather than poetical. She cites her collaboration with composer Colin Labadie (who simultaneously composed a score for which these poems are to be recited to) inspired much of the way these pieces took shape: specifically, Labadie's "minimalism, his fascination with numerical structures, his use of loops." All of these qualities borrowed from Labadie are evident in the poems here, most intriguingly the use of loops. As many of the shortest pieces do not employ any end punctuation, there is a sense that the individual poems, and not just the book as a whole, can be re-read over and over again in as a continuous looping mantra. Though Jernigan's chosen themes and expressions at times walk the thin line between universality and cliché, their familiarity in general is not unwelcome, but rather comforting, specifically in a time so fraught with public dissension. "What happened, happens,/what was, is", one piece states, before concluding: "agony, and bliss". It is this keen sense of what is essential that guides Jernigan through these meditations. If the pieces are occasionally a little too conventional in their wisdom or too pat in their rhymes ("we are one,/branch and fruits/fruit and vine,/vine and root") it seems a small price to pay for the reward of encountering a book so attuned to our necessity for coping. about their place in our world. However, this interpretation is quickly challenged by later poems, in which the insects seem to stand in for the men as perceived by women. See, for example, "Swarm", which alludes to the locust-like devastation wreaked by widespread misogyny: "They behave the way they must/...In blind collective instinct, they swarm./ Locusts, slippery and slick, carpet hundreds/of square miles, strip every plant/and crop in their path..."
was a trick of scattering light. and closer to that consuming light. Nor are the poems all necessarily metaphorical. Several poems in the book's second section treat their animal subjects more literally. "The Plume Trade" is, as its title suggests, a horrific recounting of the slaughter of birds as part of the feather trade ("Left the chicks screaming and the adults raw and bleeding/festering in the blazing sun"). The haunting "Torishima" evokes another bird slaughter: "...hunt them/in the millions with baseball bats to make pen quills,/aigrettes and mattress stuffing, thought the birds/fools who didn't flee." "Silkworm" unfolds in small sections, detailing the history of silkworm cultivation and massacre in the interest of silk production: "To harvest silk, we boil the worm in its own cocoon". All these notions of mass animal killings in the name of capitalist production invite a Marxist interpretation of these poems. Later in the book, religion comes under scrutiny: in "Origin" one of Charles Darwin's crewmates declares, "They say he [Darwin] killed God/But.../I swear God was all around us". What Frank seems to be approaching in poems such as this is a concept of Nature and animal life as a secular re-conceptualising (an evolution, perhaps) of the ancient metaphysics of religion. See, for example, "A Philosophy of Zoos", one of the collection's standout pieces: Frank perceives the denouncement of animal deities in favour of a single, non-representational 'God' as being an early warning sign of what has been passed down to us as speciesism: "Monotheism drove them from the ancient/temple, replaced the horse goddess Epona,/the golden calf, the jaguar ... with the worship of an abstract god. Animal/demoted to demon". 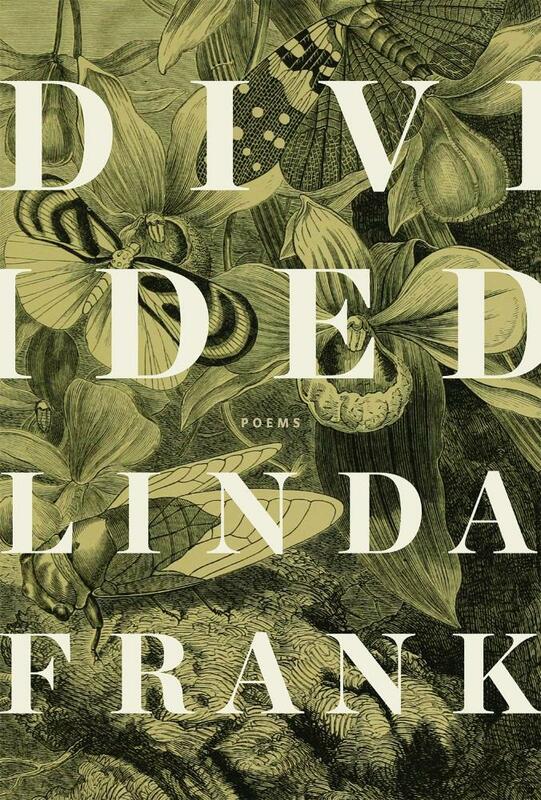 Identity politics has become the prevailing theme of most recently acclaimed poetry collections, but Frank ventures into boldly unmapped territory by evoking animal rights amidst her meditations on gender, race and class oppression. Rarely is an animal's uncanny glare rendered so effectively by a poet: "How then, to experience the holy shiver? How to look into the eyes/of powerful alien beings/and experience the fear and awe/we once found there?" For the Frank of these poems, and for her perceptive readers, the 'holy shiver' many attribute to the power of faith can be found in the uncanny, comprehending gaze of an animal. None of these interpretations are ever in conflict with one another. Rather, they enhance an already dense set of poems by offering sundry entry points. In a time where much popular poetry resembles candid notebook entries or performative tantrums, Frank's poems arrive refreshingly and consolingly classroom-ready. I focus so much on these first two sections of Divided because they are poetically the strongest. Section III, with its portraits of singular but unappreciated women throughout history, is engaging as history but too literal as poetry. The lives reconstructed in the poems would make for a wonderful collection of essays, and Frank's appendix which ends the whole volume is welcome and necessary research material, but as poetry these narrative pieces are overshadowed by the cryptic flourishes of parts I and II. Part IV feels even less of a piece with the first two sections, as Frank's autobiographical poems lack the depth of the more stylised pieces and, as stories, they can't live up to the epic scope of the lives explored in section III. However, taken as a whole, Divided is an exceptionally strong collection. The incongruity of the latter two sections with the first two just poses one more challenge of interpretation for the reader to overcome, one which will surely be worth embarking upon during sumptuous re-readings, seeking out previously dormant holy shivers. Zachary Thompson is a writer with a B.A. in English Literature from York University in Toronto. He also received a Certificate in Creative Writing from the University of Toronto Continuing Education program. Zachary currently lives and works in Hamilton.